As part of our Thanksgiving hack week, one of our engineers, Ashton Galloway, experimented with adding a Pinterest share button to Kinja. While testing it out, the button was briefly visible on our sites, and we got an immediate response from our editorial team. They very much want to an easier way for readers to share content to Pinterest. 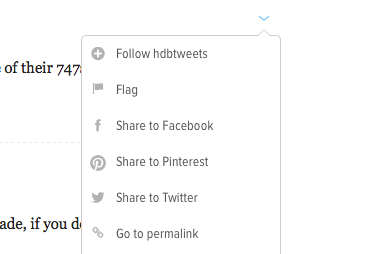 And so, here we are, we're going to give the most basic Pinterest share button a try. Before we make the call of whether this specific Pinterest button has a permanent place on Kinja, we want to understand how much it's used and what the impact is on the amount of referrals we get back from Pinterest. The button has been live on Lifehacker and Jezebel for the past few weeks, but the test needs a wider audience. Beginning today, we're adding the share button to every post on Kinja. We'll let you know what we learn. Update 1/14: After a little more than a week, the usage is still relatively low (~300 interactions each day), so we've added an on-hover Pinterest button to images on Lifehacker. You'll find the button on the lower-left hand corner of images on story pages.